Clockwise from left, works by Matthew Dercole, Diane Sullivan, Joan Lurie, Joshua T. Wood, Margret K. Haydon and Bob Bruck. There is an old Eastern proverb about the blind men and the elephant, where each one learns a different truth about the creature based on the part he touches with his hands. 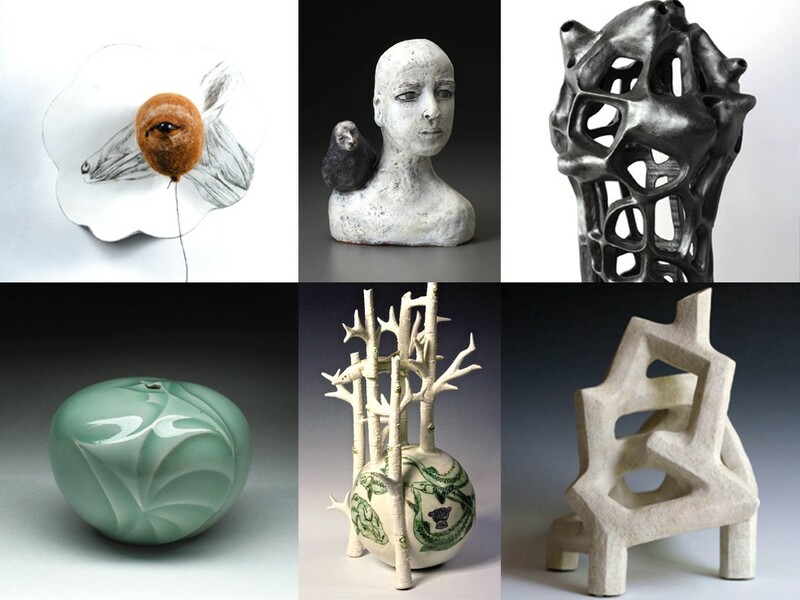 EWU’s biennial ceramics exhibit is a little like that: each of the 18 works reveals something different about clay. If you were looking at Sharon Brill’s work, you’d think clay was a soft, gentle medium so malleable that forms can be rendered with the faintest touch. Her Conch reflects the artist’s interest in spontaneous, intuitive forms — what she describes as the “search for what lies behind the overt.” Working with ultra-fine porcelain, Brill manipulates thin slabs of clay into flowing forms, leaving them in a pristine white state, which allows light to play off the undulating surfaces as if they were silk. To Matthew Dercole, the white surface of the clay is a blank canvas. In “2 Clearer Vision From The North,” he’s created a white, thought bubble-shaped form onto the surface of which he’s drawn a deer head in delicate lines of gray and black. Over that, Dercole superimposes a brown felt balloon — a string hangs down from the oval orb — into which he’s inserted a very real-looking deer eye. The piece has a disturbing whimsy typical of Pop Surrealist works. It also points to the ability of the artist to anticipate the inclusion of 3-D objects, making clay an ideal medium for working in mixed media. That’s what Joe Page has done with “Flower Field,” which combines slipcast, cloud-like forms of porcelain clay, with wire cloud shapes, wood, paint and vinyl. Similar to installations he exhibited at the Kolva-Sullivan Gallery, Page’s work resembles a videogame of simplified shapes in unknown relationships indicated by precisely rendered lines in pumped-up pastels. It’s a trendy utopia, yet looking closer, we see the seams in the slipcast forms, imperfections Page purposely reveals to those with a discerning, even skeptical eye. Lisa Truax adds metal, wood and paint to create the illusion of a charred rock floating above molten, vermilion lava in her “Residuum I.” Or perhaps it’s the remnants of an ancient fire ritual — residuum meaning what remains after part is removed — with the metal ring symbolizing something that has broken its bonds. Continuing in that vein is Mark Gordon’s “Chain Log,” which reflects the North Carolina artist’s interest in scrap yard treasures and machinery. Rust-colored and pockmarked, the form and surface appear ravaged, as if dredged from an ancient shipwreck. In contrast to the smooth, luxuriousness of porcelain clay, Gordon’s piece exploits the gritty nature of stoneware and earthenware used in numerous pieces in the exhibition, which has been highlighting contemporary ceramics for 11 years. The exterior finishes shown here are also divergent. Brian Molanphy’s “Fountain,” inspired by his trips to Provence, France, are a synthesis of his interest in rounded and squared forms, as well as of color. Using a technique called marbling, where different colored clays are manipulated to create a marbled look, either by mixing the clay together or by using liquid clay called slip.